EXETER – The cost of doing business in Exeter is going up, and China’s unwillingness to accept America’s recyclables is not helping. Exeter City Council passed a rate increase on existing commercial waste hauling at their March 26 meeting. And they established new rates to cover the cost of recycling and organics. Where businesses were paying nothing before, they will be paying as low as $36.80 per month for a 2 yard bin container, serviced once per week, or as high as $161.70 per month for a 6 yard bin container services twice per week. But it is not just recycling they will have to get used to paying. The City is also implementing a new commercial organics rate. Organic waste, meaning food, green, landscaping, nonhazardous wood and food-soiled paper waste will range in rates as well. A 96 gallon cart serviced once a week will cost $18.40 per month, but a 2 yard bin container serviced twice a week will cost $110.30 per month. The newly established commercial rates are only new to Exeter businesses. Surrounding communities like Farmersville and Woodlake, in addition to the County of Tulare have already implemented some these rates. The costs are nearly comparable. Where Exeter will now be charging $36.80 per month for a 2 yard bin container, Woodlake charges $78.29 and Farmersville charges $35. For a 6 yard bin container serviced once per week, Exeter will charge $81.90, almost $4 more than Farmersville at $78, but still less than half of Woodlake at $176.35. Exeter’s commercial organics rates are still higher than that of Farmersville and at some points Woodlake. A 96 gallon cart serviced once per week will cost businesses $18.40 in Exeter where as it costs a Farmersville business $17.50 and a Woodlake business $16.00. A 2 yard bin container will cost Exeter businesses $66.20 per month, and cost a Farmersville business $63.00. But in Woodlake, the cost is $85.00. New rates are not the only costs businesses now have to contend with. 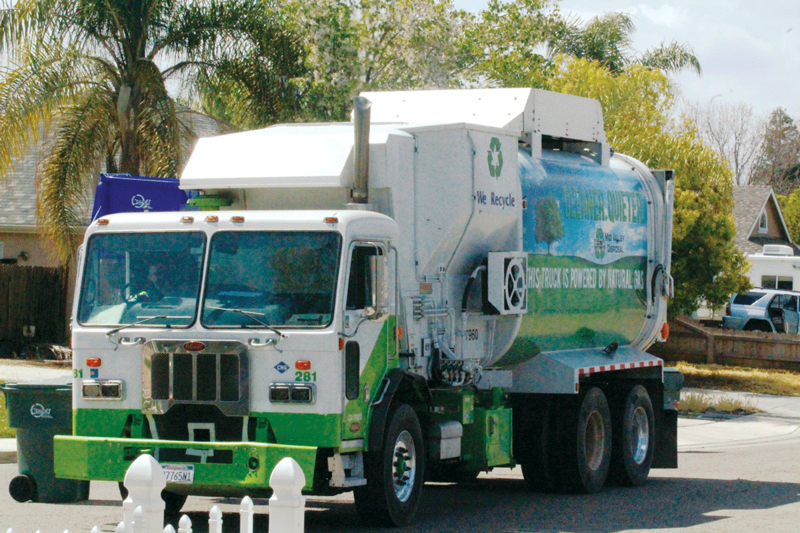 At their March 26 City Council meeting, the City also raised existing commercial refuse rates. One yard trash bins serviced once per week that cost $42.10 per month to service will soon cost $48.00. On the other end of the spectrum six yard trash bins that cost $302.21 per month will soon cost $329 per month. Before the City’s move to add new rates and ratchet up existing ones, businesses were able to take advantage of recycling services for free. Exeter’s waste service provider, Mid Valley Disposal, offset the cost of collection and disposal by selling recyclables to China. Unfortunately, the Chinese market for mixed paper and mixed plastics has dramatically declined over the last two years. China has been the worlds leader in processing recyclable material for consumer products. Steve Frank of Pioneer Recycling in Oregon, owns two plants that collect and sort 220,000 tons of recyclable materials each year. The majority of it went to China, according to a January 2018 New York Times article, Plastics Pile Up as China Refuses to Take the West’s Recycling. The Times says Frank hoped to export his waste to Indonesia, India, Vietnam and Malaysia. According to news.nationalgeographic.com, China accepted as much as two-thirds of the world’s recyclable material in 2016. Amounting to 10,225 million metric tons. For comparison Turkey accepted just 160 million metric tons in the same year. China’s dramatic slow down on recyclable imports has left exporters like Mid Valley holding the bag. According to an Exeter staff report, average mixed paper exports yielded almost $180 per ton in the spring of 2017. By the spring of 2018 the same ton yielded less than $20. Now, Mid Valley Disposal president Joseph Kalpakoff says they are making only $7 a ton shipping recyclables from Oakland. “Unfortunately, things went into one basket of China and when that basket got a hole in the bottom it sent everyone scrambling,” city manager Adam Ennis said. Aside from the once robust Chinese market, according to the City of Exeter, cost of business increases have also led to the higher refuse rates and the establishment of recyclable and organic rates. Exeter’s city staff report notes that the largest cost associated with waste streams is for collection. “The operation takes people and truck transportation, so the increase of wages and fuel costs have created increased costs for collections and disposal of all waste streams,” an Exeter staff report stated. The law has been implemented in several phases since 2016 with the aim of reducing 2014 levels of waste by half. On. Jan. 1, 2017, businesses that generated 4 cubic yards of organic waste per week were mandated to arrange for organic waste recycling services. In August of the same year, all jurisdictions were told to provide information about their organic waste recycling program implementation in an annual report submitted to CalRecycle. CalRecycle conducts their formal review of jurisdictions on a two-year basis. According to an Exeter staff report, if CalRecycle determines that the statewide disposal of organic waste in 2020 has not been reduced by 50% of the level of disposing during 2014, the organic recycling requirements on businesses will expand to cover businesses that generate 2 cubic yards or more of commercial solid waste per week. The report adds that some exemptions may no longer be available if the target is not met. But as for businesses that are going to incur a new cost for their recycling efforts, Qualls and Ennis say Mid Valley plans to work with them to reduce as much of the cost as they can. “As part of this program they have asked their contract hauler and recyclable coordinator…to work closely with our businesses to have an evaluation of the waste they produce and to see what kind of cost benefit could be realized by adjusting some cans,” Qualls said.